Israeli soldiers caused, Sunday, dozens of Palestinian schoolchildren to suffer the severe effects of teargas inhalation in a school in Orif village, south of the northern West Bank city of Nablus. Media sources said the soldiers invaded the village, before storming the local high school, and fired a barrage of gas bombs at students protesting the invasion, causing dozens to suffer the effects of teargas inhalation. Medics rushed to the school and provided the wounded students with the urgently needed medical attention, and moved many of them to a local medical center for further treatment. It is worth mentioning that the school has been a target of frequent attacks and violations by Israeli soldiers and illegal colonialist settlers and was shut down six times this current semester. 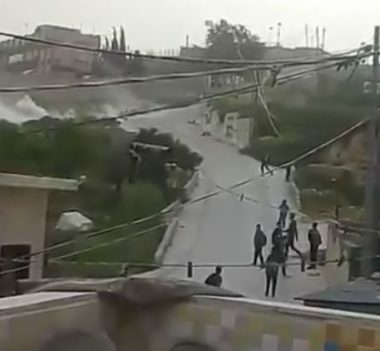 The latest assault was carried out after illegal Israeli colonists from Yitzhar colony, which was built on Palestinian lands, attacked the village and several surrounding village, and damaged to cars in addition to causing fractures to one Palestinian.